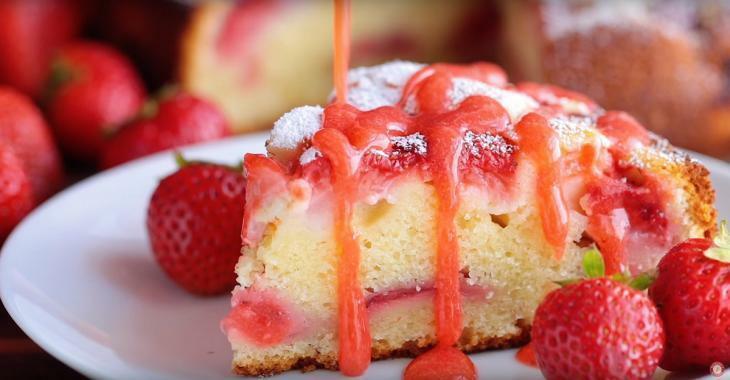 The cake has a soft, slightly sweet and moist crust, with bursts of strawberry flavor in every bite. One of our favorite strawberry recipes. Preheat the oven to 375 degrees F and line a 9 inch springform pan with parchment paper. Prepare 12 ounces of strawberries for the cake : dice 6 oz of strawberries and slice the second 6 oz into halves. In a large mixing bowl, using an electric hand mixer (or stand mixer), beat 2 eggs with 1 cup of sugar on high speed for 5 minutes or until the mixture is thick and with a light color. Add 1 cup sour cream, ½ cup oil, 1 teaspoon vanilla and beat on low speed until well combined. In a small bowl, whisk together: 2 cups flour, 2 tsp. baking powder and ¼ tsp. salt until well incorporated. With the mixer on med / low speed, add the flour mixture to the dough 1/3 at a time, letting the flour incorporate with each addition and continue mixing until well combined. Pour half of the dough into a prepared pan. Top with 6 oz diced strawberries and spread the remaining dough on top. Cover the surface with 6 oz. of halved strawberries, cut-side-down, pressing them slightly into the dough. Bake at 375 ° F for 45-55 minutes (mine was perfect at 50 min), or until a toothpick inserted in the center comes out clean without wet cake batter. Let the cake sit in the pan for 15-20 min, then remove the ring and cool to room temperature or until slightly warm. In a blender, mix 16 ounces strawberries and ¼ sugar, and blend until pureed. Allow the cake to rest in the pan for 15 to 20 minutes then run a thin spatula around the edges to loosen from pan. Cool until just warm or at room temperature. To serve, dust with powdered sugar if desired and drizzle individual slices generously with strawberry syrup.